Yesterday American doctors informed us that our budget should also include an item for follow-up treatment. By now we have raised some money and are continuing to also raise funds to be able to pay for subsequent check-ups and treatment. We can do this with your help. Thank you. we stop at €800’000 ==> depending on where in the USA the therapy will happen, it will cost more or less. #helpilayda we collected over €200,000 so far – a first in the D-A-CH region of countries – social media can make something happen. Our campaign to secure the funding needed to save Ilayda Yildiz’s life is in full swing. Our German blog entry, #helpilayda – Crowdfunding Kampagne: Rettet das Leben von Ilayda Yildiz, was launched successfully last Friday. Who and what is this story about? The above picture shows (from left to right) Nuhhaci Yildiz, Hülya Yildiz, Ilayda Yildiz and her sister. At the center of this story is Ilayda Yildiz (second from right in the picture above). She was born December 17, 2005 in Singen, Germany, a community on the Swiss border. On February 27, 2012, shortly after turning six, Ilayda Yildiz’s parents were informed that preliminary tests suggested their child had leukemia. Additional tests revealed it to be acute lymphocytic leukemia (ALL), also known as acute lymphoid leukemia or acute lymphoblastic leukemia. The majority of leukemias diagnosed in childhood are ALL. About 75 percent of all childhood leukemias are ALL (see New York Times – Leukemia In-Depth Report very nicely structured, plenty of facts, numbers and diagrams). 150 in Switzerland die annually because they suffer from a chemotherapy-resistant type of leukaemia. But thanks to a new therapy, 92 percent of these patients can recuperate fully. Every year up to about 1350 of 1500 patients in Germany or 130 of 150 patients in Switzerland and thousands more in France, Spain, Italy and the Netherlands could be cured! The above image shows Ilayda backstage at Violetta – the Disney Channel Telenovela where a talented teenager returns to her hometown in Buenos Aires after living many years in Europe. Where does this leave Ilayda? Like 20 percent of leukaemia patients, Ilayda suffers from a type that is described as chemotherapy-resistent. Her only option is a personalized treatment called T cell therapy. This is a process whereby the patient’s own T-cells are removed and genetically engineered to attack his or her cancer cells. The modified t-cells are called CD19-chimeric antigen receptor T cells or CD19-CAR T cells (information from the US National Cancer Institute). These modified cells are then reinjected into the patient. In various tests, the “CAR T-cell therapy can help patients that suffer under acute lymphoblastic leukemia (ALL),” (see ASH 2014, Abstract of study 382). This treatment has been tested and successfully administered to several patients. The Children’s Hospital of Philadelphia has conducted tests under the auspices of the US FDA (Federal Drug Administration) for CAR T-Cell therapy; they are leaders in the field. We decided to try to raise the money to save Ilayda Yildiz’s life, so we launched the #helpilyada #crowdfunding #campagin. We have all heard about crowdfunding campaigns to launch new products or influence the Presidential campaign. We also have seen others raise €100,000 or more for a child. So, here is the poster for our campaign – you are welcome to use it to share good thoughts! So we need people like you. People who care about others and are willing to do some good. It will not cost you a fortune, and some will give more than others. No matter what, every donation is generous and every single dollar counts towards helping to pay for Ilayda’s treatment. Crowdfunding is part of fundraising, but crowdfunding focuses on one project with a time limit. In the case of the #helpilyada crowdfunding campaign we want to raise enough money to pay for Ilayda to receive life-saving CAR T-cell therapy at The Children’s Hospital of Philadelphia (CHOP for short). For instance, we need resources to pay for Ilyada and her family to get to Philadelphia (US) and back. Her parents and sister will have to accompany her to provide the support she needs to keep up her spirits. So if you know an airline that could help, please reach out to us here through the blog or via the contact form. We will get in touch with you like Speedy Gonzales. But real cash is necessary to pay for the laboratory and genetic engineering work at the hospital to produce and pay for the CD19-chimeric antigen receptor T-cells, or CD19-CAR T-cells for short. The procedures and required hospital stay must be financed as well. At this stage the family has raised €90,650 (2016-02-03), so there is still a long way to go – another €700,000. Ilayda’s parents are at their limit. Their financial resources are tapped out, and the emotional rollercoaster hasn’t helped. Likes on Facebook are great. Using our hashtag #helpilayda helps too. But what we need most is donations from the heart! 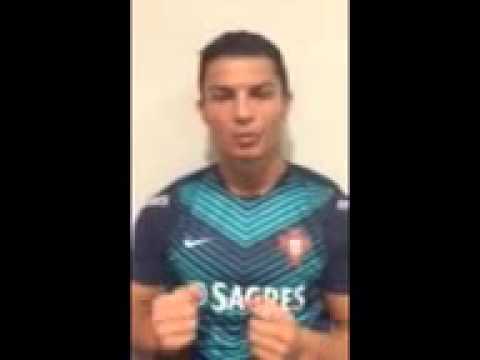 Even Christiano Ronaldo (Real Madrid) has joined the fund raising efforts for Ilayda Yildiz. He wishes her great success. Your donation can be the last bit we need to make it happen and save Ilayda from a life cut indecently short. Here is your chance to be part of the group that support Ilayda’s fight for survival – do it with a smile. 2. How can we get airline tickets, hotel stays and so forth to make this happen? We need your help to connect with those who can provide tickets. Can you make use of your contacts? Ilayda’s parents and her sister (what a trooper she is!) will have to travel with her, so Ilayda has the emotional support she needs to keep fighting. What about Novartis, can you help us get Ilayda into their European trials? Anybody have an idea, maybe Susan Longman who is Head, Drug Regulatory Affairs, Europe and Great China at Novartis Pharma AG? 3. Will we get the crowdfunding or is it a pipedream? We do not know if we will succeed with this crowdsourcing project. But we feel it is worth every hour of our time to help save another child’s life. We need your support and help to make this happen. Your comment here, and your Like is an important step. But please do not stop there, go beyond and become one of our donors. The treatment doesn’t exist until we transform the patient’s own cells into CTL019 cells and deliver them back to the patient. Apparently, European health authorities have helped Novartis start clinical trials across the Atlantic, as mentioned by Eric Couture, head of Regulatory in the Cell and Gene Therapies Unit. – As of 2016-02-03, we have raised €90,650, but we still need YOUR CONTRIBUTION to get another €709,350 to make this happen. Please, don’t forget to to ask your employer to match your donation. This will help your donation go much further! Thank you. The airline industry makes billions every year – there must be some way you could donate the flights to get Ilayda and her family to the Children’s Hospital of Philadelphia and back home to Southern Germany? I’ve donated – will you help too? Thanks so much for donating to this campaign. If 100 companies gave just $1000 – the cost of a small event marketing campaign, and 7,000 people gave just $100 – the cost of a fancy dinner out for a family of four just like Ilayda’s, our fundraiser would be over in a day. So no donation is too small, every bit helps. The more the quicker, the merrier and the more successful we will be. Yes I hope that many people will donate. They should get their companies to donate as well. Of course. Maybe we can mention some of the airlines like @KLM to get their attention. We will see. A group in the Canton of Baselland donates CHF 7’000 from this week’s evening event – get-together. I mean how can you top this …. is that not impressive? I can´t erase Ilayda out of my head. So I keep thinking about her and most of all HOW TO HELP HER. 1. One of my questions how much Money does the Treatment and its Medication cost? 2. How much has been donated so far and how much is still required? Why do I ask this? Because I want to try to activate my Network and I´m sure they gonna ask me this as well. I will post the Link on Monday when they´re all returned from the Weekend and I´d be glad to know by then. Thanks so much for your help with this. Jana has informed us on the German language blogpost that we have surpassed €101.000 but…. (this information we received from Ilayda’s parents Friday afternoon). Of course we feel this is great but we have moved to phase 2 of our campaign. We want to raise the next full 100’000 to get over 200’000 Euros. How much we will require in the end to pay for the therapy, going to the US to get it done and so forth does, in part depend which hospital will be doing the procedure. These talks are in progress as I write this. In about 10 days Ilayda will have another bone marrow punctuation. Based on these results we hope for that the transfer to the US hospital can happen quickly. We really appreciate the help from the many people we have been getting for this health and disease-related #crowdfunding for the #helpilayda campaign. In 2012 the Yildiz and many helpers launched a typification campaign that went international and, according to our best knowledge saved 40 people’s lives. For me personally, this shows how the family is very willing to help others as much as their daughter. That is exemplary and truly special! While Ilayda also benefitted from this campaign, her cancer has come back, thus this escalation of our fund raising efforts. Irene, I appreciate your and your friends’ efforts and I think this is a great way how social networking can help.